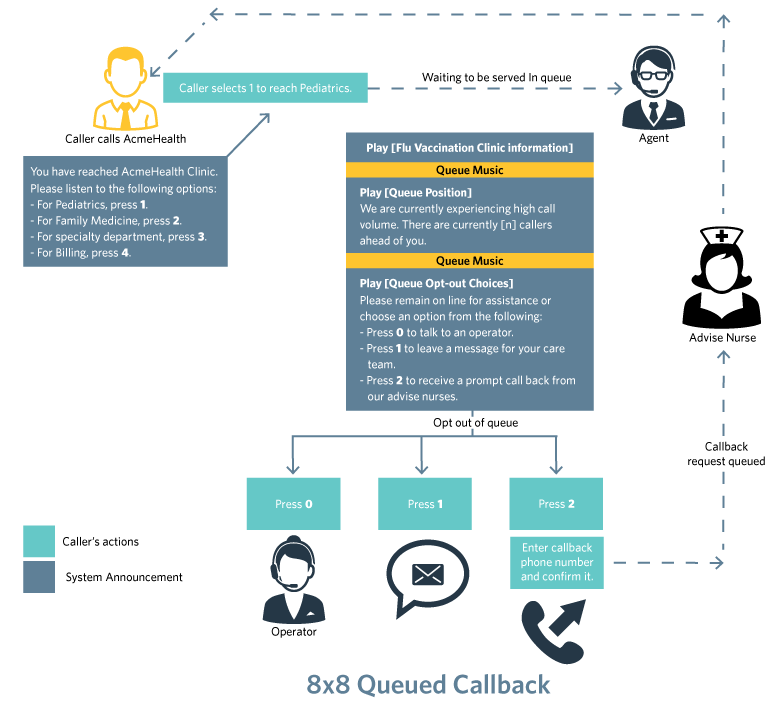 The 8x8 Queued Callback allows callers waiting in a call queue to opt out of the queue and be called back when an agent becomes available. This feature detects the caller phone number or allows the caller to input the callback number before exiting the queue. The system retains the queue position of the call and offers an outbound call to an available agent serving the queue. When the agent accepts the call, the call is dialed out to the caller using the callback number. The call is routed through an outbound queue. Caller is allowed to input the desired callback number or caller's phone number (ANI) is used. Queue position is maintained when caller opts out of queue in favor of callback. Callback is initiated as soon as an agent is available. Allows callers to opt out of the queue and be called back when an agent becomes available. Detects the caller phone number, or allows the caller to input the callback number before exiting the queue. The system retains the queue position of the call and offers an outbound call to an available agent serving the queue. Caller can input the desired callback number or caller's phone number (ANI) is used. Extending the use case, AcmeHealth offers callers the option to receive a call back from the advise nurse team for a better experience. In addition to the exit choices of operator assistance and leaving a message for the care team, the caller is given a choice to be called back by the advise nurse team. If a caller opts to be called back, he is prompted to input the call back phone number. This number is then restated for confirmation. 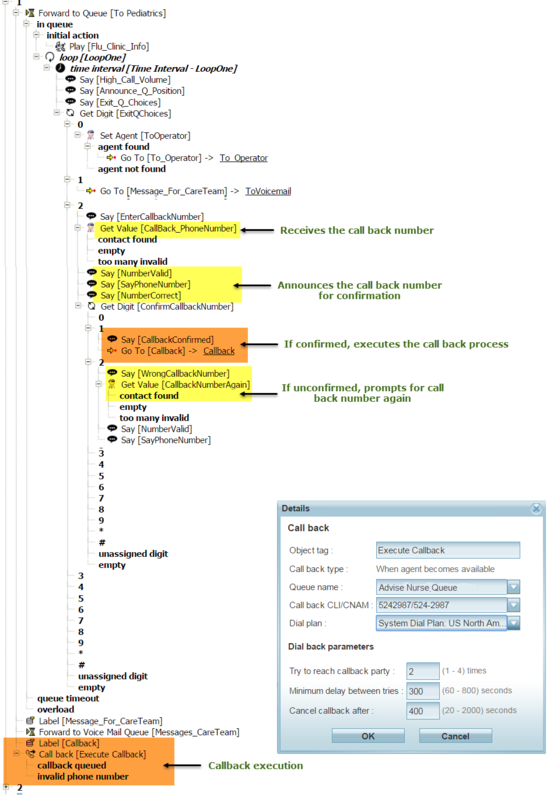 The following diagram shows the updated call flow for Queued Callback. To enable call back, Virtual Contact Center IVR offers the following scripting capabilities. Callback object supports calling the customer back by maintaining the queue position even after the caller exited the queue, and initiating an outbound call when an agent serving the queue is available. Follow the steps 1 through 3 explained in In-Queue Treatments and Controls. Modify the Say statement that announces the exit queue choices to include the option for callback. Under Get Digit, add an option to Get Value. For Data to Collect, select customers: Phone Number. Add a few Say statements to announce the call back number input by the caller. With Get Digit choices, allow the caller to confirm the phone number or prompt to enter the phone number again. Add a label for callback execution. Call back ANI: Select a channel number for outbound caller ID. Expiration time: Set an expiration time for call back. After the specified period, the call back is abandoned. Under Dial back parameters, you can specify the number of retries and the duration for time out. - Agent did not answer the call. - Agent answered, but the outbound leg dials out and experiences a busy network. Minimum delay between tries: Specify the time delay between tries. Cancel callback after: Enter the duration after which call back request needs to be canceled. Save the script and assign it to a channel.